Maersk Line, a Danish business conglomerate which is the world's biggest container shipping company by capacity and goods volume, delivered more than 1 million containers at Xiamen port, Fujian province in 2018, doubling the number in 2013. The company, which serves the transport, logistics and energy sectors, has always maintained close cooperative relations with Xiamen port. In 2007 when Songyu wharf, part of Xiamen port, was put into service, Emma Maersk, the then largest container ship operated by the company, was the first to drop anchor at the wharf. 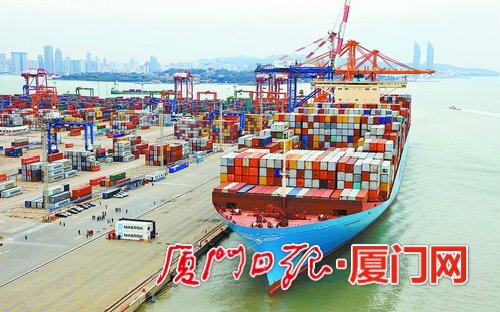 "Over the past five years, Maersk has gradually used Xiamen port as its regional base to operate its various business, including international transit and empty container repositioning, which explains why the company can deliver more than 1 million containers at the port in a year," said a spokesman for Xiamen Port Holding Group Co, operator of Xiamen port. After rounds of upgrading, the Songyu wharf is capable of receiving two 200,000–ton container ships at the same time, leading the wharfs in the Asian-Pacific region. On the first day of 2019, two container ships from Maersk, 398.5-meter Edith and 366.5-meter Enping, berthed at the Songyu wharf and delivered roughly 6,000 containers. The high quality service offered by Xiamen port is attractive to the Danish company. The port lowered or annulled numerous governmental and non-governmental charges in 2018, saving more than 150 million yuan ($22 million) for companies and 40 percent of the time used for customs clearance can now be saved at the port thanks to its intelligent logistics platform.